The flooding in the Mississippi River Valley that has already killed at least 18 people in Missouri and Illinois could get worse before it gets better. 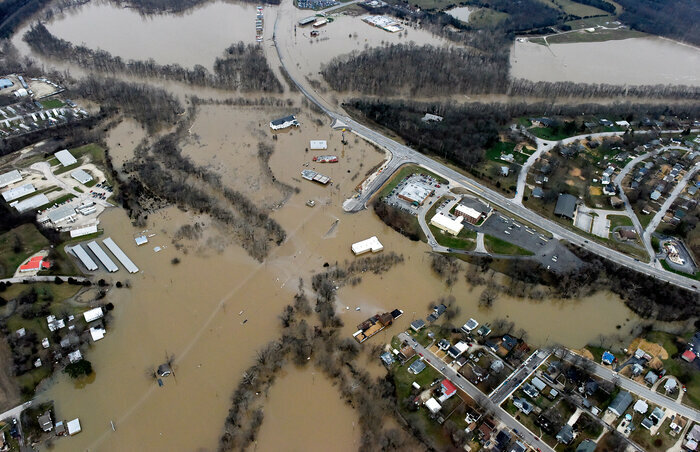 Willis Arnold of St. Louis Public Radio reports from Arnold, Mo., (about 25 miles south of St. Louis) that "the water level is expected to increase a little bit" and that residents feel like the flooding is going to get worse before it gets better. Arnold spoke with an aid worker who said he had been assisting with flood-fighting efforts for three days and expects to continue for two more days at least. The Associated Press reports that the Mississippi River "is expected to reach nearly 13 feet above flood stage on Thursday at St. Louis, which would be the second-worst flood on record, behind only the devastating 1993 flood." Missouri Gov. Jay Nixon told CNN Wednesday he was "very concerned" about the flooding over the next day and night. Not only are the floodwaters expected to reach an all-time high, he said, but low temperatures increase safety concerns. "It&apos;s cold out there," Nixon said. "This is not a summer flood. This is dangerous." Arnold also says that a number of people told him they haven&apos;t slept in over 36 hours because "they&apos;ve been out sandbagging and trying to protect their homes and possessions." Reuters notes that "past historic floods on the Mississippi in 1993, 1995 and 2011 all occurred during warm weather, after snow melts up north." "AccuWeather senior meteorologist Alex Sosnowski said it is highly unusual to have this kind of flooding in winter and more trouble could come in the spring.
" &apos;The gun may be loaded again for another major flooding event,&apos; said Sosnowski, who cited the El Nino weather pattern as the source of recent heavy rains. &apos;You&apos;re not supposed to get this kind of heavy rainfall during the wintertime.&apos; "